Recently Microsoft announced some changes to their line up of professional level exams. The changes see are return for the MCSA / MCSE acronyms that disappeared about 6 years ago when Microsoft moved away from MCSE / MSCA (Microsoft certified Systems Administrator / Engineer) to a new format. I wanted to just get down my thoughts about the new exams and also outline what this actually means in practical terms for anyone taking the exams. 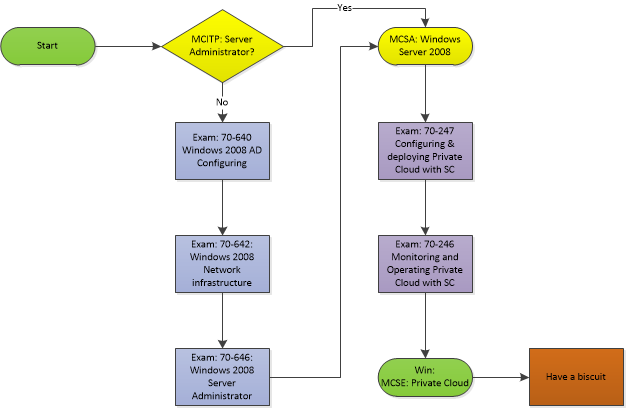 First Lets have a quick recap of the original MCSE / MSCA exam series – to achieve the MCSA you needed 4 passes, with a core of MS Client OS and Server exams (in the generation of your choice, i.e 2000 or XP/2003 etc..). To then go on and achieve your MCSE you again had some core exams of AD design and Advanced Server technology, but could then choose from a selection of exams how to make up the rest. The MCSE was about 7 exams in total if I remember correctly. There were also some “specialisations” available such as MCSE:Messaging or MCSE:Security to show more specific focus. Then in about 2007 Microsoft replaced these with MCTS and MCITP. These qualifications were split into two tiers with the basic exams being the MCTS (Microsoft certified Technical Specialist) and then those exams building up into an MCITP (Microsoft certified IT Professional). The MCITP exam was designed to build on TS qualification and allowed people to show in a slightly more granular way what areas they had expertise in i.e. you could be an MCITP in 2008 but also a TS on System Center Configuration Manager. The downside was that this change wasn’t ever very well communicated or understood by the people that mattered to: employers / IT Managers and recruitment @~!”& specialists. Introducing the latest “innovation” in exam branding / technology / confusionology … The Microsoft Certified Solutions Associate and Microsoft Certified Solutions Expert which cunningly abbreviate to…. You guessed it MCSA / MCSE. The idea, I believe, with this change is that it’s timed to include the new set of System Center products, or as MS now refer to them it’s “Private Cloud” platform. As you can see there is a lot of power and flexibility hidden inside the SC suite, and I guess that’s why the first of these new exams is based around the System Center suite. Not many System Admins / IT Technicians know what SC can do or how it can help optimise day to day operations but with people wanting to differentiate themselves with industry qualifications Microsoft will be creating a “generation” of IT Administrators who know exactly what System Center can do for them. They haven’t said much about what’s going to happen for new qualifications, other than the MCITP is no longer going to be developed. This could prove interesting for areas like Exchange which have previously had a two tier exam structure (two / three exams for the MCITP: Enterprise Messaging Administrator) and might see a return to the old style MCSE:Messaging qualifications. I guess we’ll find out in due course as the new generation products near launch? If you go and have a look at the MCSE / MCSA requirements you will see that their is an overlap between the MCITP:Server Administrator qualification and the new MCSA. This is likely to be very deliberate and anyone with the Server Administrator qualification will receive an email by the end of the month informing them of their new qualification. Also interestingly these new qualifications will require re-certificate every three years which brings things more in-line with other industry exams. In practical terms this isn’t much of a burden as the product lifecycles are usually between 2-4 years. Lastly Microsoft are currently running an offer on that gives 2 for 1 on some of the required exams but studying for the SC exams is going to be a bit tricky at the moment as the products only got recently released so official courses / books might be a little way away.